Go to the bargain bin section of any major book barn and you’ll more than likely see something with a title very similar to this one. These books tend to be clunkers, huge tomes with microscopic print on poor quality paper, with a Table of Contents page that could easily be torn from one book and pasted into the next and no one would ever know the difference. Without even opening the book, you know you’re going to find the same two of three stories by Poe, the same tried but true Arthur Conan Doyle stories, and, just maybe, if you’re lucky, an occasional tongue-in-cheek ghost story from Oscar Wilde or Saki. The publishers might get a wild hair and throw in a surprise or two, such as “The Rocking Horse Winner” by D.H. Lawrence, or something by Arthur Machen, but don’t count on it. And therein lurks the really big problem with doing an anthology of this sort. After all, how do you manage to bring together a selection that doesn’t look exactly like a dozen other books already on the market? Despite the fact that writers have produced a huge volume of horror stories over the past few centuries, let’s face it, not all of them have stood the test of time. Bram Stoker is a good example. Dracula is, by all rights, one of the finest pieces of horror fiction ever put to paper. However, out of the vast body of short fiction that Stoker produced, few stories, with the possible exception of “Dracula’s Guest” and “The Judge’s House” still pack a punch today. One could make similar points about writers such as Robert W. Chambers and Oliver Onion and a dozen or so others. So the question becomes, how do you give us our money’s worth without boring us with the same old stuff? To that end, the folks at Bloody Books have succeeded with their second volume of Classic Tales of Horror. They put themselves to a hard challenge; namely, giving us something new while at the same time giving us something of high quality, and all in all, they did a very respectable job of it. When I first picked up the book I was a little doubtful, I have to admit. It was smaller than I expected a book of this sort to be, and the cover art a little sparse. Then I turned to the Table of Contents page and saw the lead off hitter, Joseph Sheridan Le Fanu’s “Schalken the Painter.” Le Fanu is no stranger to anthologies of this sort, with stories such as “Green Tea” and “Sir Dominick’s Bargain” being the usual selections. “Schalken” was a good choice, I thought. Not totally unique, but still a solid story that doesn’t get as much airplay as it deserves. And then I started to scan down the page. I saw a bunch of familiar names, such as M. R. James, who is arguably the finest ghost story writer EVER, and H. P. Lovecraft, and Ambrose Bierce, and Edgar Allan Poe, and I thought, Hmm, not too shabby. Good names, certainly. But here’s the kicker. I started looking at the selections, and I was amazed. When was the last time I had seen Poe’s “William Wilson” anthologized outside of Poe’s Collected Stories? And Ambrose Bierce…everybody’s read “An Occurrence at Owl Creek Bridge” and “The Damned Thing,” but “The Moonlit Road?” What a pleasantly unexpected find. I reread it, and was reminded of the feeling you get when you hear an old song that you had forgotten you liked so much. It was that kind of pleasant surprise. I was equally thrilled to see “Canon Alberic’s Scrapbook” from M. R. James and “The Picture in the House” from Lovecraft. “Canon Alberic” is one of James’ non-ghost story stories, and one of his best. Likewise, when you mention Lovecraft, you expect to get “The Rats in the Walls” or “The Call of Cthulhu” or “The Horror at Red Hook,” so one of his lesser known short pieces such as this was a good choice. But the real thrill, for me anyway, was seeing the three Biggies listed here, George Eliot, Henry James, and Edith Wharton. Anybody who remembers Dorothea’s description of the cottages in Middlemarch knows that George Eliot can write some scary stuff when she feels like it, but when have you ever seen one of her short stories make an appearance in a horror anthology? What a wonderful surprise that was! And the same is true of Edith Wharton’s story “Afterward.” Henry James is, of course, no stranger to the scary story. His masterpiece, The Turn of the Screw, is after all, one of the best pieces of psychological terror you’re likely to encounter. His story included here, “The Friends of the Friends,” is not quite on that order, but still a wonderfully quirky selection that adds to the distinctiveness of this volume. “The Body Snatcher” by Robert Louis Stevenson and “The Monkey’s Paw” by W. W. Jacobs, round out the book. Neither is an especially unusual choice and can usually be found in most other books of this sort, but they still work well here. “The Body Snatcher” is an eerie tale of grave robbing, and “The Monkey’s Paw,” if you discount Ezekiel’s vision of the valley of dried bones in the Old Testament, is probably the first true zombie story–so even if it does get overplayed, it’s still worth a reread. Perhaps the only stumble Jonathan Wooding made in putting this book together was the inclusion of Mary Shelley’s “The Mortal Immortal.” Like Stoker, Shelley succeeded in giving modern horror one of its finest novels. Frankenstein (or the Modern Prometheus) is one of those books that gets better every time you read it. (I’m talking about the 1818 version, mind you. The later version, the 1832 version–at least I think that was the year–is a classic example of the old adage, If it ain’t broke don’t fix it.) Unfortunately, Shelley didn’t produce a whole lot of merit beyond Frankenstein, and after reading “The Mortal Immortal,” you’ll probably see what I mean. But then again, that may just be a matter of personal taste. You be the judge. What you’ll get when you pick up Classic Tales of Horror, Volume 2, is a compact anthology of unique selections printed on high quality paper in an easy-to-read print. I can only hope for more volumes in this series, because what I’ve seen so far is outstanding. And on a personal note…Jonathan Wooding, if you’re reading this, see if you can stick Coleridge’s narrative poem “Christabel” in Volume 3. Just a thought. A while back I gave a talk at the San Antonio Writer’s Guild on incorporating real life police procedural techniques into your fiction. The talk went well. When I started to write my speech, I knew that I wouldn’t be able to turn them into Joseph Wambaugh in the few minutes I had available, so I decided to give them some broad brushstrokes instead. Basically what I did was to condense an awful lot of information into ten handy rules for writing about cops. You can read those rules here. But I also wanted to include some references for them as well, so I made up a list of some nonfiction books that I thought might prove useful. I also came up with a second list of some examples of popular fiction writers whose books give a more or less true to reality view of police procedure. With that in mind I thought I would elaborate on those references here. What follows is the first of a two part post on writing references for police procedural writers. Today’s post is the non-fiction reference section. This is by no means a comprehensive list. Instead, I tried to give a sample of what’s out there, both the good and the bad. I hope this list helps some of you. Good luck. Forensics for Dummies by Douglas A. Lyle. Inexpensive, easily available, and offering a reasonably good overview of the many different disciplines involved in forensic study, this book is a great place to go to learn the language, so to speak. However, it will definitely not be enough on its own to make you conversant in forensics. Recommended. Every Contact Leaves a Trace: Crime Scene Experts Talk About Their Work From Discovery Through Verdict by Connie Fletcher. Again, this book will not make you an expert, but Connie Fletcher does a wonderful job with everything she writes. She collects a huge number of interviews with people actively working in the field, and many of those interviews provide great, personal perspectives on the job’s joys and frustrations. Highly Recommended. Crime Scene: Inside the World of the Real CSIs by Connie Fletcher. Once again, Connie Fletcher repeats her winning formula of stringing together numerous interviews from experts in the field. If I had any complaint with this book at all it would be that it focuses too narrowly on violent crimes, ignoring many of the less glamorous areas of forensic study, such as crash investigations and information gathering. The result is a slightly distorted view of the crime laboratory, and might lead people to think that there is little or no overlap between disciplines. For example, the time, distance, and speed calculations a crash investigator uses to investigate car wrecks can also be used by the murder detective to recreate a suspect’s movements through a shooting scene. A rule of thumb is to think of forensics as tools: they can do any number of jobs. What really matters is the person using those tools. Despite that objection, this book, like everything Connie Fletcher writes, is highly recommended. What Cops Know by Connie Fletcher. This is my favorite Connie Fletcher book. Compiled from more than 80 interviews with patrol officers, this book gives you one of the best pictures of police life from the street officer’s point of view. The best stories come from where the rubber meets the road, and this book is loaded with them. Practical Homicide Investigation by Vernon J. Geberth. This book will set you back a little financially, but if you’re going to be writing crime fiction to any degree at all, go ahead and resign yourself to the fact that you’re going to have to get this book. By far, the best single source textbook for crime scene investigations out there. It will take you step by step from the first officer on scene to testifying in court. Criminal Investigations by James N. Gilbert. Of all the many textbooks in the field, this one is probably the worst. Poorly written and loaded with typos, it does offer a certain amount of usable information, but there are far better choices out there. Avoid it like the plague. Police Field Operations by Thomas F. Adams. This is another book that fails to live up to its promise. It is too vague to use as a reference. Like many textbooks of this sort, it tries to be applicable to a wide range of potential readers, and as a result it fails to address anybody’s needs in any sort of depth. Not recommended. Blue Blood by Edward Conlon. I’m mad at this guy for writing the book I should have written. Conlon is a genuinely talented writer. His observations of life on the job are spot on. The book is not an apology for the profession, either. He tells you the good and the bad. It is a bit long, but there is so much valuable information in there that the added length is perfectly excusable. The Investigative Reporter’s Handbook: A Guide to Documents, Databases and Techniques by Brant Houston. An amazing book. While not exclusively about cops and police techniques, this book illustrates the direct relationship between the media and law enforcement. Many of the techniques outlined in this book to aid the investigative reporter are in fact identical to the ones used by modern police detectives. I woke up Friday morning to some tragic news. Joseph McGee, 23 years old, author of Snow Hill and The Reaper and a score of wonderful short stories, was found dead in his apartment Thursday morning. His death was due to complications from diabetes. Joe was a good friend of mine. We communicated regularly through email, several times on the phone, and he was kind enough to show me early versions of his manuscripts for The Reaper and Snow Hill. 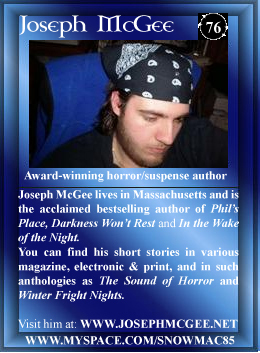 I was honored that he listed me in the acknowledgements section of his beautifully haunting tale The Reaper. For me, Joe embodied all that is so very right about the writing community. He was young, enthusiastic, smart, and generous with his time. I wish I could say I saw a lot of myself in him, but the truth is my head wasn’t on nearly as straight as his when I was that age. Joe was always looking for a way to improve the world around him. He had a charitable spirit, and a genuine interest in helping those in need, a tradition that his family is carrying on in his honor. I’ll miss you, Joe. There is so much tragedy in the world, but it gives me hope that the same world we see on the news each night could also produce a heart as kind as yours.